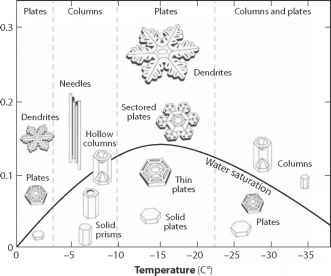 This chapter has provided a brief, general overview of the essential thermodynamics that drive freezing, melting, and the internal temperature evolution of the elements of the cryosphere. Fluxes of energy between the atmosphere, cryosphere, and underlying substrate (ground or water) shape the extent and thermal character of snow and ice and also feed back on regional and global energy balances. Radiative, sensible, and latent heat exchanges between the atmosphere and cryosphere are all important, and chapter 8 describes the ways in which these exchanges impact weather and climate. The internal heat transfer and surface energy balance processes and the examples described here apply to all aspects of the cryosphere. Subsequent chapters build on this through considerations that are relevant to specific aspects of freshwater and sea ice, glaciers, and permafrost. In particular, chapter 4 builds on the physics that define the internal temperature evolution, through coupling of Eq. (3.5) with the equations that describe lake ice growth. The additional physics of phase change and freezing front migration are also important for sea ice and permafrost growth, as all of these are driven by thermal diffusion of cold atmospheric temperatures to depth in water, snow, ice, or the ground. Similarly, changes in any aspect of the surface energy balance, through climate warming or through changes in humidity, winds, clouds, and so forth, will alter the energy that is available for snow and ice melt, via Eq. (3.1). This is central to cryosphere-climate interactions, and chapters 8 and 9 return to several of these processes.